Saguaro National Park is located to the west and east of Tucson, AZ, home of the giant saguaro and the largest cacti in the country. The giant saguaro have become the symbol of the American West, and are found in few parts of the nation. 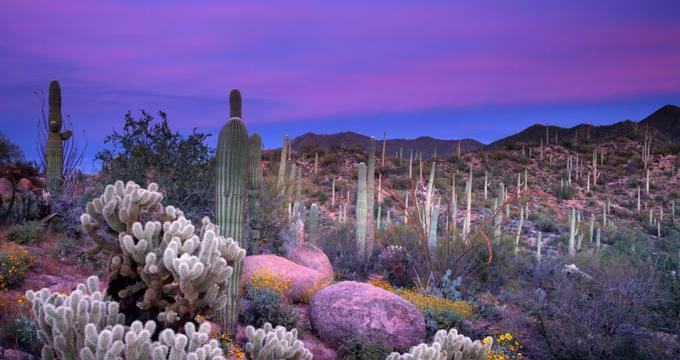 Visitors to the park can view these massive, majestic cacti with the beautiful desert sunset in the background. 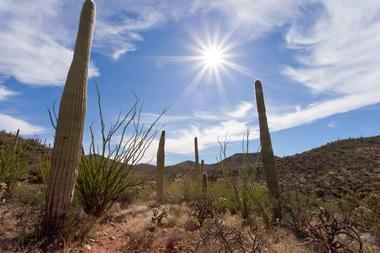 Saguaro National Park is about much more than just cactus though. People have lived in the area for thousands of years, from the prehistoric Hohokam to ranchers and homesteaders. They all left their own mark on the land as they raised families, planted crops, hunted, and tended livestock. 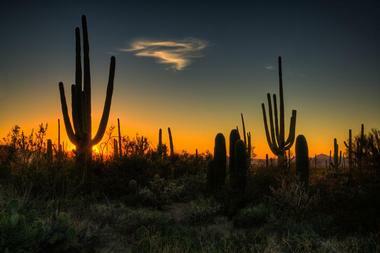 Saguaro National Monument in Arizona was established by Herbert Hoover on March 1, 1933. The monument contained the almost empty desert, fifteen miles to the east of Tucson. Times, however, sometimes change quickly. President Franklin Roosevelt, just two months later, gave the order for sixteen national monuments to be given to the National Park Service. Thus, Saguaro started its journey to the national park it is today. This progress was often painful. Young cacti were trampled on by cattle for decades, "cactus rustling" was rampant, and water had to be hauled from the town's center by early rangers. Aging cacti and a lack of regeneration caused many people to believe the giant saguaro was a dying breed, quite a bit like the frontier life the cactus symbolized. In the 1950's, a visitor center was opened in the park, and a better understanding of the life cycle of the giant saguaro through significant scientific research was brought by 1970. President Kennedy, at the urging of Secretary of Interior Stewart Udall and the citizens of Tucson, added an additional twenty-five square miles of spectacular cactus lands located in the Tucson Mountains to the Saguaro National Monument. The national monument became Saguaro National Park in 1994 after Congress set aside an expansive amount of wilderness area. For visitors looking for adventure in Saguaro National Park, a long hike into the park's rugged wilderness it a great opportunity for some adventurous exploration. An overnight hike through the park's wilderness will take hikers around fifteen miles from an elevation of about 3,000 feet to more than 8,000 feet. Hikes can begin from any of the five trailheads. These trails range from the Douglas Spring Trailhead, which is easy to access at Speedway Boulevard's east end, to the Italian Spring Trailhead, a remote trail that can be accessed through Reddington Pass. The Tucson Mountain District and the Rincon Mountain District make up Saguaro National Park. The Rincon Mountain District stretches from the eastern side of Tucson, while the Tucson Mountain District stretches from the western side of the city. 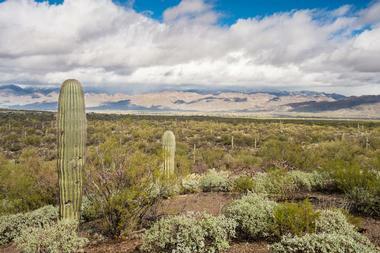 These two districts were created to preserve and showcase the Saguaro Cactus forests. While most think of the park as a desert park, there is much more to it than that. 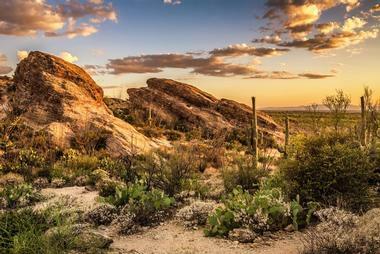 The well-known desert environment exists more at the park's lower elevations where Sonoran Desert vegetation is found. The Tucson Mountain District, ranging from 2,180 feet to 4,687 feet in elevation includes two biotic communities, desert grassland, and desert scrub. The average precipitation each year is about 10.27 inches, and wildlife commonly found in the area includes the desert tortoise, Gambel's quail, and coyote. Saguaro National Park's Rincon Mountain District ranges from 2,670 feet to 8,666 feet in elevation and consists of six biotic communities. The biotic communities include mixed conifer forest, pine forest, pine-oak woodland, oak woodland, desert grassland, and desert scrub. The average precipitation per year is about 12.30 inches. More diversity in wildlife and plant life, as well as more biotic communities exist in the Rincon Mountains than the Tucson Mountains due to its peaks reaching a substantially higher elevation. Animals such as white-tailed deer, Mexican spotted-owls, black bears, and Arizona mountain king snakes live in the Rincon Mountain District because of the higher elevation. 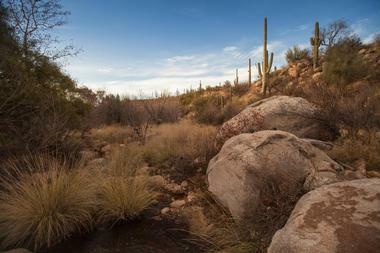 Many different species of animals call Saguaro National Park home, despite the Sonoran Desert's foreboding nature. Adaptation to the desert's scarce supply of water and high temperatures has been key to these animals' survival. Several species avoid the hot temperatures during the day and are only active during the night. Some seek shelter in burrows or shaded nests. Other animals possess features that help them stay cool in the high temperatures, such as the large ears of the jackrabbit that radiate heat away from its body. An assortment of unusual animals live within Saguaro National Park, a few of which only exist in southern Arizona. Collared peccaries, horned lizards, roadrunners, and Gila monsters are all often seen by visitors. 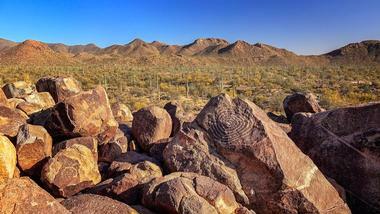 While the park is located on the Sonoran Desert's edge, Mica Mountain stretches in height to over 8,600 feet. The altitude of this mountain, found within the Rincon Mountain District, allows for pine trees and cooler temperatures. This environment is home to mammals such as white-tailed deer and black bears. Coati, as well as other species more often associated with tropical environments, also can be found within Saguaro National Park. Desert waters that are often hidden contain mud turtles and aquatic leopard frogs. Plant life can be found in abundance throughout Saguaro National Park, despite the fact that the park is situated in a desert. These plants have adapted to drought conditions are able to go dormant during long periods of no rain in order to conserve their water. The plants may look lifeless during these times, however, after rain falls they come back to life with green leaves. The park is in fact full of green vegetation throughout the rainy season. Within only two days following a rain shower, the ocotillo plant's appearance changes from what seems to be a small pile of dead sticks to a happy shrub covered in leaves on tall green branches. Many different plant species can be found throughout Saguaro National Park thanks to the varying elevation levels. According to current research, approximately 400 species exist in the Tucson Mountain District and approximately 1,200 different species in the Rincon Mountain District. 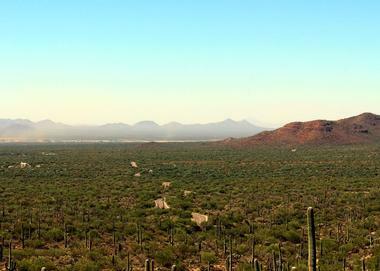 Since Saguaro National Park is located in a desert, many people may think that there isn't much water in the area. However, this isn't exactly true. The park contains several unique water aspects that help the broad variety of plants and animals survive the desert environment. There are two districts that make up Saguaro National Park, one to the east of Tucson and one to the west. The two districts, while the same park, are immensely different. The east side district is higher in elevation, rising from the valley to more than 8,000 feet at Mica Mountain. Vegetation varies from temperate pine forests to desert scrub. More than thirty inches of rain falls on the mountain each year, providing streams and springs down farther on the mountain front with water. The west district has a lower elevation with mostly desert vegetation, and only receives about a foot of rain each year. Younger visitors are encouraged to explore and discover new things in the Saguaro National Park environment through activities such as a desert hike, dissecting owl pellets, drawing a cactus, or using a backpack stove to cook a trail snack. These are only a handful of the possible activities kids can experience when they participate in the Junior Ranger program at the park. 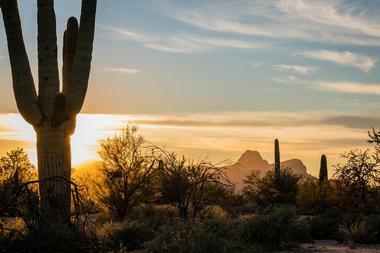 The park service believes future stewardship of Saguaro National Park is extremely important. Junior Rangers are explorers, learners, and protectors of the national parks. They discover new ways they can help ensure there will be parks in the future to visit. Junior Ranger participants learn about things they can do both in the parks and at home. Upon completion of the program's activity booklet, participants are sworn in as Junior Rangers and also receive a certificate and badge. There a few ways children can become a Junior Ranger. The first way is for them to pick up a workbook at the Visitor Center for the Self-guided Discover Day Pack. The pack takes about one to three hours to finish and is completely self-guided, allowing kids to complete it at their own pace. Children participating in the Junior Ranger program and their families explore the park using the activity booklets specifically designed for them. These booklets point out interesting things that perhaps wouldn't be noticed otherwise, as well as introduce visitors to park stories. The new No So Junior Ranger Program at Saguaro National Park gives children's parents, seniors, and young adults the opportunity to participate in their own ranger program. Participants try to collect as many points as possible by completing activities such as hiking trails, stopping by visitor centers, answering trivia questions about saguaro, and observing wildlife. Children can also now become Online Junior Rangers if they aren't able to participate in the Junior Ranger Program at the park. More information about this can be found on the park's website. A second way children can become a Junior Ranger is by joining one of Saguaro National Park's fun Summer Junior Ranger Camps. The summer programs are held in the east district in the park. Kids are able to discover the desert by learning about the importance of water, the native animals of the desert, and how to safely hike in the desert. There are also interactive activities, games, and more.